If you’re looking for the best fishing rod out there, you might already feel overwhelmed because of the number of possibilities that you can choose from. In order to help you make an informed decision, our experts have put together a short buying guide, as well as a number of best-performing products that you may want to take into consideration. Assuming that you don’t have the necessary time to go through thousands of different fishing rod reviews, your consumer favorite is the Fenwick Aetos Ice Spinning Rod, because it has the right weight, an ultra sensitive detection, and it features a high-modulus blank construction, Fuji Skeleton reel seats, and titanium frame guides with lightweight titanium inserts. However, should this product be out of stock at the time of your purchase, you can always go for the Frabill 371, which is a solid second option. The ice rod is lightweight, convenient, and user-friendly, regardless of the weight that you will choose for your angling endeavors. It’s made from quality materials and can be utilized under a variety of circumstances, regardless of the weather or water conditions. Some users report that this particular pole is a tad stiffer than what they would have liked it to be. As it offers great value for the money and it is a portable alternative, this light ice fishing rod is totally worthy of your consideration. It’s also rather affordable compared to other choices, and that’s something to take into account if you are on a budget. As an excellent all-around panfish rod, the Frabill 371 is another choice to add to your list if you’re in the market for a budget-friendly alternative. It’s made out of impressively durable materials and has been outfitted with a solid cork handle with graphite reel seat. Even in extreme situations and temperatures, this model can be a friend in need. The 371 Straight Line Bro Quick series is available only in two sizes, the 30” and the 35” ones. Because it offers more than enough value for the money, this Frabill ice fishing rod is another option to bear in mind. Functionality and craftsmanship have been neatly combined in this product as it offers all the perks of a well-designed ice fishing rod. Available in medium and medium light options, the pole has graphite blanks and aluminum oxide guides which seem to provide more than enough reliability, sturdiness, and long lastingness. Some ice fishermen have reported that the tip of the rod seems to be too stiff for their purposes. While this Fiblink model is a somewhat pricier ice fishing rod, it’s worth noting that it’s extraordinarily easy to use and convenient as it significantly reduces the strain one might feel when battling with fish. Ice rods have to be resilient to all sorts of mishaps, but they should also come with with the right weight for your specific needs. The materials they’ve been manufactured of also matter quite a bit. If you are in the market for a brand new rod that allows you to focus on your performance, the Fenwick Aetos might be just the right choice. It is a versatile and highly usable alternative that has been praised time and again. It’s sensitive and capable of excellent performance thanks to its high-modulus blank construction, titanium frame guides, titanium inserts, as well as Fuji Skeleton reel seats. The product is available in three sizes ranging from 25 to 30 inches. After having analyzed the user feedback gathered by this model, we have concluded that it is worthy of your consideration as it seems to provide plenty of value for every cent spent. The Fenwick Aetos is a light rod that does its job under a broad array of circumstances. With a high-quality build, you can rest assured that the pole will serve you for as long as possible, no matter how harsh the weather is when you go out ice fishing. The Aetos is available in three sizes ranging from 25” to 30” with variable powers and actions. For example, the 25” choice is ultralight while the 30” one is medium-heavy. Something else worth mentioning about this choice is that it comes with titanium guides and inserts, which are capable of reducing line friction and expanding the durability of the product. Given that it is sensitive and light, you need a bit of experience to handle this rod properly. Some complaints revolve around the fact that this pole seems to be a bit stiffer than what some anglers might have expected it to be. If some of the benefits you are looking to get from your ice fishing rod are efficiency, convenience, and durability, perhaps you should take the time to take a peek at the specs of the Frabill 371. It’s one of the most highly regarded choices out there, and that’s because it comes with pretty much all the features you might ever want from such a product. Having been equipped with titanium main guides, the pole is both durable and lightweight, which basically means that you won’t have any trouble handling it. The materials that the unit has been made out of are rugged and will inevitably put up with the abuse of extreme temperatures. Also, the model has been outfitted with a solid cork handle to which a graphite reel seat has been added. All of these details are surely impressive if we were to consider the money you’d have to pay for the rod. We couldn’t help noticing that it usually costs under fifty dollars, which only makes it more valuable. To date, the unit has received favorable reviews. Some ice fishers argue that the pole has greatly influenced their performance and that with its help, they managed to catch more fish. This rod features titanium main guides that are virtually bullet-proof. The guides keep the fishing line flat on the fishing rod to effectively prevent tangles and breakage. There is less friction due to the abrasion created between the line and the surface of the rod. Light and extremely durable, the guides are designed with resilience against cracks or damage under sub-zero temperatures. You will surely love the solid cork handle in a split grip design. It provides effortless control and also delivers ample sensitivity to help you feel the fish biting. The blank-through-handle construction effectively transmits vibrations in the water straight to your hand, enabling you to act fast to execute hook setting. With the deluxe hook keeper, you can keep your miscellaneous small items within easy reach, so you need not rummage through your tackle box too often when you require fresh tackle. This product suffers from the same issue that besets lesser known brands: only a few people know about it, so it remains largely unnoticed on the market. While trying to make up your mind which fishing pole best satisfies your needs, you’re likely to come across this Fiblink Inline alternative. While it is among the most affordable products in the line, a low price does not mean low quality with this one. We’ve seen that many online retailers sell it for less than forty dollars, which is a fantastic price for such a well-built piece of equipment. The model has the neatest combination of functionality and craftsmanship, considering that it has been constructed with the consumer in mind. This unit is a lightweight alternative that does what it’s supposed to do and does it very well. From what we’ve seen, the model is available in both medium and medium light powers. Thus, manufacturers are trying to give a helping hand to all types of fishermen. In spite of its low weight, this rod has been built to last. The blanks are made of graphite while the guides have been constructed out of durable aluminum oxide. Reliability and long lastingness are two of the features that are among the most highly spoken of in the Amazon reviews of this alternative. We’ve noticed that many individuals claim that they were pleasantly surprised by the performance of the rod and by the fact that it can withstand extreme weather conditions and still last through the years. As for the stiffness of the rod, some say that they’ve found it to be too much so. On the other hand, this detail seems to be a matter of personal preferences, as other individuals claim that they’ve used the pole to fish for more than one hundred bluegills without encountering any issue whatsoever. Even though it is true that an ice fishing pole has to be flexible at the tip, this one seems to get the job done even if it might not have the most malleable end. Another factor to consider when prospecting the market for a new ice fishing rod is usability. When it comes to ease of use, the Fiblink Graphite option is a net winner, considering that it has a solid cork handle that allows fishermen to enjoy a sure grip. The handle has been designed in such a way that the user hardly feels any strain at all either when simply holding the rod and waiting for a catch or when he or she is trying to get a hold of it better. We’ve gathered that the Fiblink is one of the most critically acclaimed alternatives in the area of ice fishing, with many online users raving about the value it offers for the price. In conclusion, if you’re looking for a relatively inexpensive pole that lets you catch as many fish as possible, you might have just found it. After all, few units can be as versatile as this one, what with various owners claiming they’ve caught anything from bluegills and panfish to heavy walleye. Delivering technique-specific action, this ice fishing rod easily matches your fishing style along with the target species. It comes in either Medium Light or Medium Power, in 24 and 30 inches length, and rod weights of either 2.2 or 2.3 ounces, respectively. The included rod bag enables the easy carrying, transport, and storage of the fishing rod. The carry system also protects the various components of the rod from the elements. Expect a durable performance from the unit during the harshest conditions. This particular choice is equipped with a lightweight construction yet is dependably strong and sensitive. The impressive blank-through-handle construction enables you to control the rod easily. Any vibrations due to the fish action can be felt by your hands. The graphite rod blanks deliver the toughness and rigidity you need without compromising easy handling and flexibility. One or two customers would like the rod to be longer than it is. Ice fishing requires the use of specialized equipment and this includes the best ice fishing rod. Ice anglers also need lines, fish hooks and spears while catching fish through an opening in the ice. Gear for this method of fishing can include heated enclosures if you’re not fishing in the open. The enclosure may even feature bunks and amenities. Typically quite short, an ice fishing rod measures around 24 to 36 inches. The abbreviated length of an ice fishing rod is due to the small hole size cut into the ice. Distance casting is not required in ice fishing so a long rod is not necessary. Even the best ice fishing rod carries a simple construction compared to other fishing poles. Majority of ice fishing rods are spinning types constructed of composite material.Geared for use with ice fishing reels, ice fishing rods are typically sold in combo with matching reels. Some anglers still use traditional wooden rods with guides numbering two to four, along with two hooks at the base of the pole onto which the fishing line is wound. The amount of time the rod blank goes from a bowed or loaded position to the at rest position is expressed as the rod action. This is typically one of the first things consumers check out in an ice fishing rod. With faster action, the rod tips farther towards the end, while with slow action, bending occurs more toward the midsection of the rod shaft. A fast action rod has a flexible tip while the remaining segments of the shaft are rigid. Greater flexibility is exhibited by a fourth or a third of a fast rod. Fast action rods demonstrate greater sensitivity than slow action poles. Vibrations are more easily transmitted on fast action rods. Slow action fishing poles have a shaft that bends throughout its whole length, delivering the greatest level of flexibility. These types are perfect for small fish and allow a better fight for the fisher. A shock absorber on a slow action rod prevents the hook from ripping clear through the fish’s mouth in hook setting. Slow action poles are typically preferred when fishing species using treble hooks. Unlike a large single worm hook, a treble hook will not bite into the fish mouth as deep, making it easy to pull out the treble hook from the mouth of a strong fish. Rods with extra fast action bend just at the tip while those with moderate fast action bend over the lower ⅓ of the shaft. Medium/moderate action poles bend over the lower half. Use a light power fast action rod for angling crappie, small trout and groupie. Larger black bass, channel catfish and walleye require the use of medium power moderate fast or fast action rods. The lure type should also match the rod action. The rod taper denotes rod thickness as well as the thickness of the wall of the rod blank. For graphite rods, this is categorized according to tensile modulus, which measures the elasticity of the carbon fibers. Lighter blanks have higher modulus. Rod power, which is closely related to line strength, is the ability of the fishing pole to carry weight from the tip and also denotes the amount of pressure to flex the rod. It reflects the suitable application for the fishing implement. Heavy power rods can handle heavy line weights while light power poles handle light line weights. Power categories range from ultra light to ultra heavy. When targeting blue catfish, flathead catfish, striped bass and muskellunge, choose medium heavy or heavy power rods with fast action. A medium-heavy or heavy power rod with moderate or slow action is best when fishing with live bait. As mentioned earlier, specialized gear is used in ice fishing. One will need an ice auger, chisel or saw to cut a rectangular or circular hole in the ice. A power auger can be utilized. Some ice fishers use an axe to accomplish hole cutting. A skimmer or a large metal spoon with holes is used to clear slush from the cut hole or to remove newly formed ice during the hole boring process. A heater proves to be useful when angling in extremely cold periods. Ice fishing can be of three main methods or types. One type requires the use of a small fishing rod. This tool should be one of the best rods for ice fishing, lightweight and with small, attractively-colored jigs or lures with bait. The bait includes fat heads, wax worms, crappie or shiner minnows. The jig effect is created by the angler by lifting the fishing rod periodically out of the hole in the ice. The second type employs tip-ups made of plastic or wood. The tip-up will have an attached line spool along with a piece of metal from the spool to the flag. The spool is wound with black line at the end of which is a swivel. A fishing line with a hook is placed on the swivel. The hook can be outfitted with small minnows, grub worms, worms or powerbait. The baited hook is lowered into the water beneath the ice at varying depths. When fish bites the bait, the flag is lifted, letting the fisher know there is fish on the hook. While the line is being pulled, the fish will fight. The line is allowed to slip through the fisher’s hands during the battle. Once the head of the fish can be lifted out of the hole in the ice, the catch is quickly lifted onto the ice. Spear fishing is the third method. This may entail the use of fish decoys lowered into a large hole. Sitting in a dark house or a dark ice shanty, the fisher watches the water under the hole while holding a large, multi-pronged spear. The points of the spear can be fitted with a line. When the fish appear, the angler pushes the spear into the water. Many states only allow anglers to catch rough fish. Some anglers use other gear such as a flasher, which is similar to a fish finder. Underwater cameras for viewing the fish can also be used. Even though 13 Fishing might not be as well-known as other brands in the industry of manufacturing tackle, the fact of the matter is that the company has a more than healthy policy and philosophy when it comes to the design of their products. In fact, most of the reels, clothing, gear, and rods made by this brand are worth every penny and can speak to the needs of ice fishers looking for good-quality, reasonably priced alternatives. All of these rules stand in the case of the NTS23UL as it seems to have been created so that it’s tailored to the requirements of extreme ice fishermen and women alike. Thanks to its unique construction, you’ll be able to enjoy enhanced performance as this rod is both sensitive and durable. Besides, it should be noted that the pole can help you get a glimpse of your catch and feel it, too. Some ice rods are too stiff to be user-friendly or convenient, but that’s not the case of this particular one. Even the handle of the pole has been made out in such a way so as to allow you to have complete control over the entire experience. The custom Evolve MYOL reel seat and stainless steel Evolve Flare guides are two other factors to bear in mind. Proven by users to be quite sensitive despite its rigid backbone, this ice fishing rod is tailored to meet the demanding conditions of the activity. Its unique construction combines the flexibility of fiberglass, steel, and wood to help you land the fish swimming under all the ice. You will love the split handle that is able to transmit vibrations at the end of the line to your hands. It also provides full control over the rod. Unlike overly stiff models, this ice fishing rod demonstrates a remarkable level of flexibility. The fish can move this way and that, but once it gets hooked, you won’t lose it easily. That is how durable it is. Available in 23 and 27-inch versions, this ice fishing rod is also remarkably suitable for both left and right-handed anglers without requiring any adjustments. Unfortunately, because the rod is manufactured by a less known brand, ice fishers only hear about it through ice fishing rod reviews and personal endorsements. The HT Enterprises IB-18 ice fishing rod offers quality craftsmanship and functionality. Featuring a corkalon handle, this ice fishing rod combines the benefits of both EVA foam and cork handles. The lightweight handle is able to retain residual heat so it stays warm and comfortable to hold even when it’s cold out. It also has a low damping capacity to transmit vibrations on the lure so the angler can go about hook setting when the fish starts to nibble on the bait. The handle is designed to be less slippery as well, which is extremely important considering the conditions in which the rod will be used. It will not compress as easily as EVA foam under load. Durability is guaranteed with the combination of materials so the handle remains intact even when subjected to abuse. The rod can be held for long periods in a beach spike or rod holder and it is also easy to clean out fish oil, protein and slime that accumulate on the grip, requiring the use of detergent only. The 18-inch long graphite composite rod combines the strengths of both fibreglass and graphite. It is geared with sensitivity, power, light weight and durability, serving a wider variety of angling applications than either fibreglass or graphite alone, making it a more affordable option compared to pure graphite rods. This is a medium action rod, which makes it a perfect option for catching channel catfish, walleye and larger black bass. It is also fantastic for jigging and worm fishing for largemouth bass and other species. The corkalon handles feature rings that facilitate mounting of your favorite reel while enabling effortless visibility along with the fast-action fluorescent orange tips. The dark blue guide wrappings ensure smooth fishing line mounting. They also deliver frictionless line attachment so the fishing line experiences little to no pressure to ensure reduced likelihood of breakage, which can be very essential when doing battle with a fiercely fighting fish. This is your go-to ice fishing rod when you need something you can carry from one location to another without sacrificing on performance and durability. Where the big fish is, Piscifun is also there as well, and the Piscifun® Ultralight Graphite Ice Fishing Rod makes your angling experience more fun and exciting! This ice fishing rod is equipped with a tough EVA handle that ensures a secure grip every time. Generally cheaper than cork handles, the EVA handle will not chip or dent as easily as a cork handle when subjected to heavy use and the most rugged conditions. This enables the angler to keep the rod in a beach spike or rod holder for extended periods of time. Quite easy to keep clean, the EVA handle just needs to be scrubbed with detergent to eliminate collected protein, fish oil or slime from all that fishing. The EVA construction also enables problem-free use with bait. Outfitted with lightweight stainless steel guides that lessen friction, the ice fishing rod ensures that the investment you make on your fishing line is optimized. With reduced friction on the line, the rod ensures fewer to no incidences of line breakage so your equipment costs are significantly reduced. The smooth line guides keep the fishing line secure and nicely flat along the shaft, eliminating tangling and too much pressure. The graphite rod blanks ensure longer and more accurate casts as well as increased sensitivity so every little bump the lure makes on the retrieve can be felt by the fisherman. Definitely lighter and stronger than fiberglass, the graphite rod doesn’t carry the weight that fiberglass rods have while ensuring strength and fast recovery, returning to its straight form as soon as the angler quits shaking the rod. The lightweight material also ensures ease of use on the arm while transmitting vibrations on the lure faster and better. Available in 23.6-inch and 29.5 inch sizes, this model delivers reliably durable performance even in the most rugged conditions. It comes in a two-piece form that ensures easy transportability and carrying. It has four tips plus one tip top to ensure that the fishing line lies flat along the length of the rod. Thanks to its ultra-light power, the fishing rod is perfect for catching small bait fish such as panfish. You can use it for lure weights between 1/64 to 1/16 oz. and line weights between 1 and 4 pounds test. The Berkley Lightning Ice Fishing Rod is designed to be responsive while never being rigid. Made rugged yet lightweight, this ice fishing rod is available in a range of action ratings to enable problem-free casting of top water lures including spinnerbaits, buzzbaits, or crankbaits. The fiberglass construction also ensures enough heft and durability so you can fish for large species such as pike, walleye and muskie, enabling easy retrieval of the strongly fighting fish. Unlike brittle and stiff graphite rods, this fiberglass ice fishing rod delivers responsive yet durable performance you can rely on even during the toughest conditions. The cork grips keep the handle comfortable and warm thanks to their ability to retain residual heat so the rod is a delight to use in the coldest of seasons. The rod utilizes hidden thread technology on its fore grip to ensure reduced wear and tear on the fisher’s fingers. The skeleton reel seat delivers better sensitivity and lower overall weight so you can position your favorite fishing reel easily. Available in a variety of models, this ice fishing rod allows you to choose the perfect fishing gear for you. The LR24ULS model is 24 inches long and offers ultra-light power, making it ideal for catching small bait fish such as panfish. This specific model accommodates 1 to 6 fishing line pound test along with lure weights between 1/64 and 1/16 oz, and features three guides. The LR28MLS model, which has four guides, is 28 inches long and offers medium light power to handle line weights of 2 to 6 pound test and 1/32 to 3/8 oz lure weights. The LR24MS is 24 inches long, has four guides and a medium power rating to handle 4 to 8 pound test line weights along with 1/32 to 1/8 oz lure weights. The 32-inch LR32MHS offers medium heavy power to accommodate 6 to 10 pound test lines and 3/16 to ½ oz lure weights. It has four line guides distributed along its shaft to ensure problem-free layout of the fishing line along the length of the shaft. The oversized stainless steel guides with factory-tested inserts are made smooth to reduce friction on the line, ensuring less likelihood of breakage. Surf fishing requires a longer rod and a high performance reel, which is what you get in this combo from Polar Ice. Designed for strength and durability, the combo also comes at a surprisingly affordable price. The rod is constructed from a composite graphite material that is durable and flexible. You will appreciate the sensitive tip that will alert you when a fish is nibbling at your bait, which is extremely helpful considering the poor visibility you have when you are fishing in the surf. The enhanced sensitivity is due to the blue colored composite blanks which allows you to feel even the slightest bite in the handle. Since you can instantly react to a biting fish, your chances of reeling it in are greatly improved. The rod also comes with a high performance reel that is capable of providing you with consistently smooth casts and retrievals. The aluminum spool is well balanced and won’t add any unnecessary weight to the rod, and with 6 ball bearings you can depend on a reliably smooth performance. The aluminum construction is also resistant to rust and corrosion, which is always a bonus since you will be constantly around water. This surf fishing combo from Polar Ice comes at an affordable price. The sturdy rod is lightweight, durable and sensitive so you don’t have to worry about a fish stealing your bait. 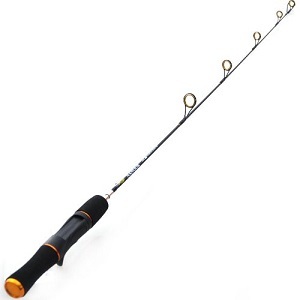 This rod and reel combo is priced slightly higher than other sets, but it should be noted it is designed to withstand the rigors of surf fishing.